This week, the 49ers’ coaching staff flew to Mobile, Alabama to scout college players, coach the Senior Bowl and prepare for the future. But part of preparation involves looking backward, specifically to 2018, and identifying where the 49ers need to improve. Figuring out where they excelled, where they struggled most and which issues could re-emerge next season if the organization overlooks them. Sometimes, a team’s biggest strength or weakness isn’t obvious. Football has an endless number of variables to examine and consider. Teams spend weeks going through all of them and dissecting the previous season. 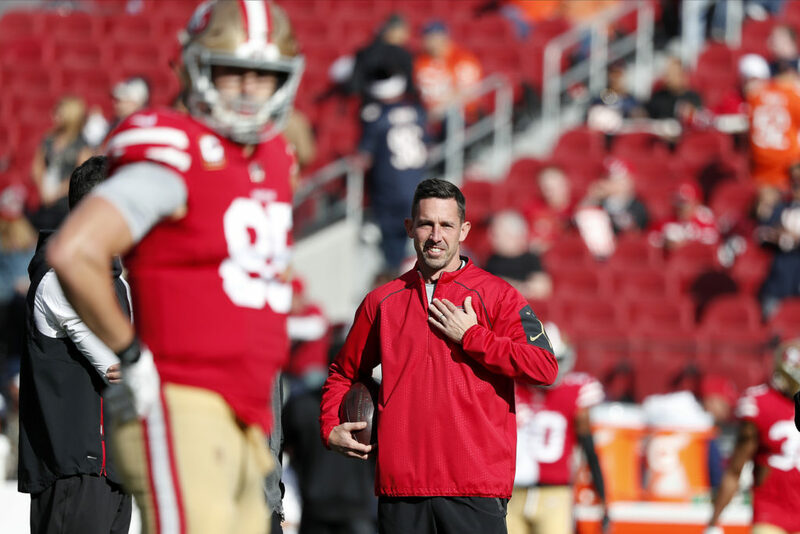 Here are the 10 stats that defined the 49ers in 2018, and what these stats could mean for them in 2019. In terms of the 49ers run game. I maintain it’s because their interior line is poor. They are ok on the move but don’t generate push or angle block properly. So they are limited to Stretch runs, which in shortened fields are not as effective. At the LOS db’s are pressed up closer to the los, and teams have more time to react. Additionally, because they cannot generate push, db’s shouldn’t be concerned with play action. Those are two hallmarks of the Shanahan offense. Quite frankly, while I like Kyle as an offensive mind and X’s and O’s coach, I think his talent/need evaluation leaves a lot to be desired. He doesn’t appear to value interior linemen as much as he should and I believe it hurts his offense. Additionally, it would appear he over-invested and whiffed on Weston at center, which is a position of value for his offense. Then, on defense they invested a number 2 overall pick on a run-stuffing DE, who’s essentially 1st down defender in their first draft and followed it by trading up for a wr when there were db’s available who could have really helped this defense. Also, when John and Kyle took over 2 years ago, the teams primary needs were Edge Rusher, Corner, Safety, LB, Interior Linemen, and wr, today the 49ers have who that has a bright future at those positions? Warner and maybe Petis? Is that really all they have to show from 2 FA and Draft classes? Really good points Shoup. Shanahan the personnel guy has to do a better job of helping Shanahan the HC. He is a great game planner and play caller, but there needs to be more focus put on the areas of weakness on his offense which is clearly the interior of the OL above all else. The biggest needs also remain the biggest needs which is disappointing a clear indication that they failed in assessing what they had. The comment about it being hard to beat out Cassius Marsh was ridiculous and hopefully a lesson learned. They need to bring in multiple Edge rushers and a FS first and foremost and the other areas will look better by association. They will still need another CB and LB to add to the depth chart but those aren’t as pressing as the first two imo. Yeah, I mentioned this previously. One of the biggest issues the 49ers had in the red zone was Richburg. He routinely got blown off the ball in the RZ. Made any kind of inside run impossible. The OGs weren’t much better. Tomlinson coupled with Richburg’s surgery, it may be imperative that the 49ers address the IOL in round 2 or if they want him to be able to switch to RT, as early as round 1? Yeah, its not something I have really focused on, but tbh getting an IOL that can genuinely upgrade a starting spot is a good idea. I really hope that this is addressed this offseason… Any round 2 through 4 guys that you believe could help the roster. Thanks for the share Cassie. I hope Ferguson starts to show a bit more. He looked a little over-matched on day 1 and this isn’t the best Oline class I have ever seen. Stat 4 JJ Stokes well not literally but a player like Stokes. As much as Stokes was criticized as a 9er he was always very good in the RZ and on 3rd downs. If they don’t draft/sign a franchise WR they need to sign a WR with avg stats but one who excels in the RZ and on 3rd downs. Stats 6,7 and 8 Sign Ziggy Ansah and draft Bosa or Allen. I know this goes directly against stat 10 but I believe it is worth the risk. Everything I read says they both will be totally healthy at the beginning of camp and the addition of 2 of those players along with Buckner, Blair, Armstead and Thomas will give them a hellacious pass rush and that will take care of stats 6,7 and 8. The Niners should sign Tyrell Williams to help in the red zone. I like Ziggy Ansah, but they should also throw money at Trey Flowers, to pry him from the Pats. I like Bosa and Allen, but the Niners should trade back to garner more second and third round picks, and select Clelin Ferrell, Jachai Polite or Montez Sweat. CJ Collier, Jalen Jelks and Justin Hollins could be later round picks. With the departure of Mitchell, they should look at Daylon Mack, Renell Wren and Khalen Saunders. I doubt you meant to list those in order of importance but IMO the IR stat impacted their season more than anything else. #1: 49ers had 3 different QB’s see significant playing time throughout the year. #2: 49ers designed a scheme to fit McKinnon and ended up with backups and practice squad players seeing significant time at RB. #3: 49ers had a revolving door at LB and Safety. All the stats you listed are obviously important. None of it is scheme related. All of it is personnel related. Shanahan and Lynch can not afford to have draft picks in rounds 1-3 that contribute nothing to winning like Solomon Thomas, Reuben Foster, Tarvarius Moore, or Ahkello Witherspoon. Lynch’s first draft is turning into an absolute disaster. Of his first 5 picks, 2 are no longer on the team and 3 look like busts and thats only in year 2 of that draft. You can’t have nearly entire drafts with zero production and be a winning NFL team. Hopefully, they get it together this offseason. If not, in 2 years both Lynch and Shanahan will be gone. Houston – If 2 years is the over/under for Lynch and Shanny leaving, I’m closer to taking the under right now. Nah, they both get 2 more years no matter what. After 4 different coaches in 4 years. York is absolutely not going to make a change before year 4 of the Lynch/Shanahan regime. He will give them time. Everyone knew year 1 was going to be rough. Year 2 was also rough but Shanahan and Lynch get a total pass because of the injuries to Garoppolo & McKinnon. Even if they only have 2 wins again next year it will be seen as key guys coming off injuries and Lynch hasn’t had a full chance for his draft picks to develop. If the 2020 season doesn’t result in real improvement and most likely a playoff berth then both Shanahan & Lynch will be fired. Edge)Pressure off both edges, combined with the A gap pressure they have now will help the secondary. One in F/A and at least one in the draft on day one or day two at the latest. IOL)Need an athletic mauler who can move to RT when Staley retires. WR)Red zone target and 3rd down machine. Secondary)Find a ball hawking play maker and add in a F/A acquisition of Earl Thomas. Agree Lynch needs to ace this draft. What he’s done so far is not looking too good right now. I would throw in that the 49ers need to add a really good RB. I have serious doubts if a guy with McKinnon’s size and type of game that relies on shiftiness and speed can fully recover from an ACL to regain top form. Every other RB currently on the roster is a bit player only, even Breida. Breida is a nice complementary back but he will never be a go to back. IMO the red zone issues are also a result of the fact the 49ers don’t have a back on the roster who can pick up tough yards when the field shrinks in the red zone. They need to find a RB either in the draft or in FA who can add another dimension to the offense. You can find a big power back in UDFA to compete with Wilson, who I thought showed the most promising power out of the other three backs…. Wilson had some good moments, but the fumbles are a big problem. I absolutely love David Montgomery in this draft and I think you can probably get him with a 3-5 round pick. I also really like Josh Jacobs but I think he’ll probably go in the 1st round. IMO, both those guys are going to be really good. I like Montgomery because he compliments McKinnon/Bredia so well. Jacobs is an Alvin Kamara type of skill set which is a perfect fit for Shanny’s offense. I think the one position you can count on the 49ers not drafting is running back. I agree with you on Montgomery, and would be surprised if he lasts until round 3…. IMO, rounds 1-3 will be need based. After that it will be BPA so any position will be an option. If Montgomery has a slow time, which is the knock on him, then he could easily fall to round 4. Montgomery in the 4th would be grand theft, especially given this is considered to be a poor top end rb class. I think the absolute lowest he’s drafted is the 3rd round. The only concern, as you alluded to, is his breakaway speed. That concern is compounded by the fact he’s one of two backs in the country to not have scored outside the redzone. In the redzone he’s been money, scoring 13 touchdowns (5th) because of high-end broken tackle numbers. Devin Singletary is another back that’s in that 2nd/3rd round territory. Another redzone menace, he scored on 23.1% (10th) of his 78 red zone carries and finished with the most red zone touchdowns (18). Josh Jacobs will probably be the first back taken, and that’s probably going to be round 2. Dexter Williams is a back that actually should be there in rounds 4-7, and he’s got a unique combination of power and speed. His Touchdown Rate and Touchdown Rate Versus Team were both top-10, and his 63% Team Share of Touchdowns was fourth out of the declared backs, averaging 6 ypc. I’m very curious to see his 40 time. I’m guessing he’s a 4.5 guy at 215 lbs. James Williams from Washington State would be a good option for the 49ers. Scooter, Williams is one of the best receiving backs in the class, and as such, it’s surprising that he had a 70% rate of getting 1st downs out of forty 3rd down and short conversions. He’s also one of three FBS players to have 100+ carries and 80+ receptions since 2000. He’s definitely a back Shanny would be interested in on day 3…. Another guy that could be picked up later is Benny Snell. He has a powerful build and really pushes the pile. Getting back JG and Jet will help immensely, and thankfully, this draft is loaded with pass rushers and WRs. The main problem is the interior O line, so they should let Person walk, and if Joshua Garnett is not the answer, they need to draft a guard. Maybe Chris Lindstrom or Martez Ivey in the third round. Yes, the Niners struggled, but with the returning injured players, a strong Free Agency, and if JL can hit a home run in the draft, the Niners can compete again, for at least a wild card spot. Lindstrom will go early but another guy I like is the Rimington Trophy winner, Garrett Bradbury. Tackle Oli Udoh (Elon) did very good against Montez Sweat in one on ones. He looks very athletic for a guy who comes in at 6’5″ and 356 lbs. Someone mentioned that WR Deebo Samuel reminded him of P. Garcon and I see some similarities as well. Deebo plays with a Linebacker mentality. I like his quick break off the LOS and he plays bigger than his size. Yep, Deebo is a young Garcon with quicker feet. Richburg and Reed to miss all of off season training. I hope this doesn’t mean Richburg can’t get in the weight room and add some muscle. I was disappointed when I read this as I am with you, was hoping he would get stronger. Not sure why they didn’t shut him down earlier. You didn’t know he was playing with an injury causing problems in his knee and quad…..? Free agents at the 3 key need positions on defense. Listed by personal ranking. I didn’t include any RFA’s. Adrian Amos is intriguing, and definitely worth a call. I know you don’t like Thomas, but if no Amos, Thomas would be solid, and if he gets hurt, should provide leadership and expertise to improve Adrian Colbert’s ability to fill in. Clinton-Dix is awful. I don’t like any of the free agent cornerbacks available, as either not enough improvement for the secondary or just bad fits for the system (Mathieu I consider a safety, and would consider him for such position). I think the Niners are better served through the draft this year at the cornerback position. As for edge, I think my top two choices (if they are available) are Dee Ford and Frank Clark. If not, then Dante Fowler Jr. as a situational pass rusher, to pair with whomever the Niners take in the first round (Bosa if he is there, or trade down for Ferrell since Fowler is the speed guy and Ferrell is the power guy, plus the fact we only have 6 picks in the draft right now). I seem to keep picking corners with broken feet. Yes you do. Most of those guys don’t fit their size preferences either. Desir is about the only one. I agree with PK. I don’t think they’ll sign a FA CB. I see them looking CB on day two or three of the draft. 2nd Round log jam of players we could use. I like Shaquil Barrett and Trey Flowers, but hope JL will pass on Clark due to his red flags. The others will most likely be retained by their teams, but will use Free Agency to boost their salary. Potential someone Kyle Shanahan may look at in the mid to late rounds, given he is coaching him at the Senior Bowl: Lonnie Johnson Jr., CB Kentucky. While Todd McShay is not the best resource, his identification of Johnson’s 6’3″ body with good press technique does make him a fit for the Niners system. While I don’t know much about him, and prefer some other big corners (Rock Ya-Sin, Amani Oruwariye, or Trayvon McMullen), if the Niners decide to wait until the 4th round, or one of their picks in the 6th, I can see them taking a chance on Johnson. He’s also got Isaiah Johnson from Houston on the roster who may interest them in the mid rounds. My apologies as I hadn’t seen your comment prior to making mine. Yeah, I’ve been seeing good things about Johnson at the Senior Bowl practices. I wonder how Mark Fields DB Clemson, did. Don’t sleep on Isaiah Johnson, CB outta Houston either! I think Stats 1-3 show the limitations of Shanahan’s offense. I think it is scheme related and #2 begins to show why. Certainly having better personnel will help. 3rd down efficiency #4 is also indicative of the challenges facing the offense. #5 is one that may be due to injuries as Beathard had slow processing speed, but it is one that bears watching. Stats 6-8 are all defense and deeply demonstrate the shortcomings of the front office in acquiring personnel. A pass rush could be very beneficial in the Red Zone, Turn Over Differential and 3rd Down. How did the team draft last year? First two picks were for offense. The D has to be well addressed or this team will go nowhere! Having a good pass rush will not allow the opposition to get their passes off as well and will create turnovers and force teams to kick FGs and also have better field position for our teams when opponents are forced to punt. I’d agree with that assessment and modus operandi. On offense the Niners need a better interior offensive line. A healthy Richburg may help, but they need to improve not only in the draft but in free agency. Picking up Roger Scaffold from the Rams could improve the Niners and hurt the Rams. KS’s offense is based on the run, they need a powerful back to punch in TD’s in the red zone. They maybe able to use Wilson and Juszczyk in this role, but if not they need a power back. Once they can establish the ability to score rushing touchdowns the rest of the red zone offense should open up. A true #1 WR would be nice, but they are not easy to find. Are there any WR’s available in round 2 or 3 that fit that role? On defense it is as everyone says; edge rusher. They should draft one sign another. I am open to anyone who can disrupt the other teams pass attack. An upgrade at corner would help, but I think they should really look at Earl Thomas. He is a difference maker and could give the 49ers a couple of good years so they can develop better safeties. The fact is the Niners cannot fix all their problems in one draft/free agency year. However; if they can add some real quality pro bowl level players who can upgrade the teams performance the 49ers can win 8-10 games next year and move back to respectability. To be completely crazy hopeful we can look to the past for guidance; can they thru the draft or free agency or by trade add a Ronnie Lott, Jack Reynolds and Fred Dean to their roster? It is not likely but it would be glorious if it happened. They can’t address every hole, but with a little luck they could narrow it down to one or two holes. Deebo Samuel is definitely going to be a guy to look out for in the 2nd round for the 49ers. Dominated every day at the Senior Bowl. Today has been RZ and he’s dominated that too. I know he’s not the super tall WR that a lot of guys here want to “fix” the RZ issues, but you don’t need to be 6’3″ plus to be a good RZ target. At 216lbs he’s not a small WR, but moves really well. Huge hands. Great RAC ability. Perfect fit for the Garcon role in Shanahan’s offense. Agreed. He is almost a clone of Garcon but quicker as you mentioned. Yep, but where would that leave Pettis? I figured he was the guy they envisioned replacing Pierre. I think the 49ers telegraphed where they envisage Pettis playing at the end of last season when he supplanted Goodwin even when Goodwin was fit. Pettis played his best football in that role, not in the Garcon role. In that case adding Samuel to Garcon/Bourne and let the best man win I’d imagine. Gonna need to take Samuel in round 2 more than likely though…. Yeah, agreed. They may be able to trade back a little and still get him though. Things like his height and injuries may make some teams hesitate. I like Samuel a lot too but think our high needs are Rusher and CB. If we can adequately address that in FA and draft then I am ok with picking up Samuel. Otherwise…. Its an offense driven league. Just look at the teams that made the playoffs, those that made the championship games. All you need is a decent D. But you need a very good offense. The 49ers definitely need to improve their D, but it is equally important if not more so to provide JG with weapons and strong protection. Can’t ignore it. 49ers have spent 2 2nd day picks on CBs the past two years and signed an expensive vet CB. Spending another high pick on a CB while ignoring other positions isn’t a good outcome. They need the guys they have drafted to start developing. Its what Joe Woods has been brought in for. Sign another vet at a reasonable price to compete and push them. Grant suggested Roby. I’m not that big a fan, but if they can get him at a reasonable price, do it. Ideally he ends up being the 3rd CB. If not, he’s not the worst starting CB in the NFL. Yep. Physical and attacked the ball. Strong hands and knew how to body out the DB. Many of the top WRs in the red zone today aren’t tall. There are multiple ways to win in the RZ, and Shanahan has repeatedly outlined (and proven in his actions) he doesn’t necessarily look for height but rather ability to get open. Can definitely see Deebo being a guy Shanahan really likes. Draft Deebo Samuels or give it to Pittsburgh for Antonio Brown? Steelers want a first round pick for him, and Deebo would be a good cornerstone for the future. Samuel is only 6′, but he weighs 214, so he can take the punishment. With his hands and separation moves, he would be a fine acquisition. Gotta also factor in the risk of disrupting the locker room dynamics. Raiders would jump at that chance to pick up AB for only a second. Hoping for the best outcome. Lynch’s rationale seemed a little waffly, but Mayhew appears to be a positive asset. Wonder what Grant thinks of Mayhew–not necessarily the promotion, just Mayhew as an effective professional. Mayhew is the link between John Lynch and Matt Millen. Mayhew and Lynch played together from ’93 to ’96. Millen flamed out spectacularly, losing 7 out of 8 of their last games, then going on to a winless season, after being fired after the 4th game. JL inherited a 2 win team, started out poorly, but ended with a 5 game winning streak. Even with the loss of his franchise QB game 3, the Niners managed a 4-12 season, and with better coaching, could have had a 7-9 season. JL is the antithesis of Matt Millen. IMO the Mayhew promotion is a serious red flag unless there’s additional news we do not yet know. I would say I’ve never known a great leader who would allow blurred lines within his organization. If one runs pro scouting, and one runs college scouting then it should be abundantly clear in their job titles. The hallmark of every great leader I’ve ever known is a highly structured organization with very clearly defined roles with exceptionally talented people perfectly suited to each role. I know there have been some successful organizations with loose responsibilities but IMO the success those organizations achieve is more by chance or strength of product rather than great leadership. I feel like this news on Mayhew is a serious red flag about John Lynch’s ability as an organizational leader. Meh, I wouldn’t sweat the job title. Its about whether they are sharing roles or not, and doesn’t sound like they will be. One will handle pro personnel, the other the draft. Its actually not uncommon for teams to divvy up those roles. The question I have is whether this is something that has come out of their internal review, that Peters was stretched too thin leading both areas, and how Peters feels about what is effectively a demotion despite not changing his title. I think you raise excellent points Houston. In terms of performance the 49ers organization seems to be a SNAFU with a lot of Kumbaya. The organizational chart of the current SNAFU probably looks like another military term that is a not suitable for this type of forum. But they have at least one more year to make some progress. Delved into the Martin Mayhew promotion. Looks like Adam Peters is being demoted. Maybe he was the one behind some of the draft misses like Foster, Joe Williams or CJB. Sounds like, how well they can work together, and a successful Free Agency and Draft, will define how well it all works out. Hope MM will handle the phones this upcoming draft. Additionally, I saw how Mullens is helping Gardner Minshew at the Senior Bowl practices. I wonder if GM is on the Niners radar in the later rounds. One good thing I saw was that the Niners are consulting with the Warriors, for advice on the Strength and conditioning coach, and the trainer. It is very smart to tap into such a successful organization. Not a big fan of the mustached marvel.